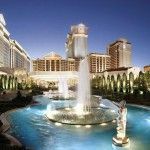 At Caesar's Palace, Resort Fees are ﻿﻿charged ﻿﻿$39+tax/night and are mandatory. The Garden of the Gods Pool Oasis features 5 differents pools: Temptune pool, Neptune Pool, Apollo Pool, Jupiter Pool and Fortuan Pool! The Venus European Pool Lounge invites those 21 years of age and over to experience fun European-style sunbathing in private comfort.